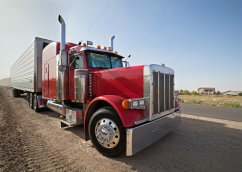 We offer a variety of financing options for commercial trucks, trailers and heavy equipment. Whether you own one truck or a fleet of trucks, purchase new or used, we have the best options to fit your needs. We understand the needs and demands of owner-operators, first-time buyers and small businesses. Our experienced lenders will guide you through the financing process – from application to closing – and work with you to customize a loan that's perfect for you and your business.